Get ready for the hottest country event of the year!! On the second leg of his massive “What The Hell” Tour Dierks Bentley is on the road with fellow country legends, the incredible Cole Swindell and amazing Jon Pardi!! The trio will hit the Oak Mountain Amphitheatre on Sunday 21st May 2017. Tickets are still available, but selling FAST!! Be sure to get yours early to avoid disappointment!! Award-winning bluegrass musician Dierks Bentley has been a massive draw on the tour circuit for years. His latest album, “Black,” was released May 2016, and sold more than 88,000 copies in its first week, becoming the week’s best-selling album. He has had over 25 singles debut on the country charts – 15 of which went to number one!! Now, the bestselling artist has teamed up with fellow top-charting songwriters Cole Swindell and Jon Pardi. 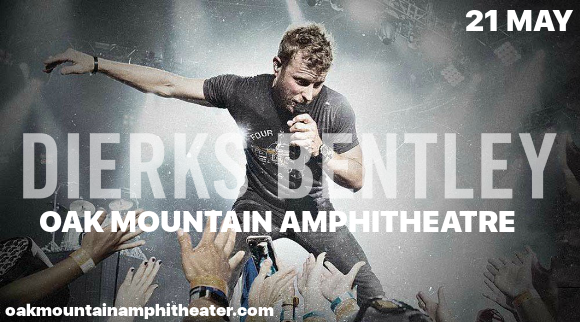 Don’t miss out – get your tickets to see Dierks Bentley, Cole Swindell and Jon Pardi TODAY! !